Comic Con, India is dedicated to expanding India’s popular culture by creating high profile events that cater to fans of not only comics but also Movies. The Telugu Film Industry, iMovie Cop and the Motion Picture Dist. Association, India Pvt. 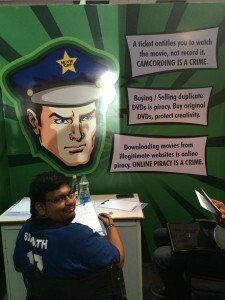 Ltd. joined hands to launch Comicorner at the 2014, Comic Con held in Hyderabad between 11-12 October. Comicorner aimed to engage audiences at Comic Con with fun activities which included “Creating your own comic”. It presented a unique opportunity to engage with the industry and consumers to educate them on copyright and content protection through interactive activities. “Comic Corner is a unique platform and an opportunity for creative minds to express themselves by creating their own comic strip. We believe that this initiative in association with the Telugu Film Industry will resonate well with audiences at Comic Con, as we continue to encourage and promote creativity and respect for original artistic works,” said Uday Singh, MD, Motion Picture Dist. Association, India.